The Mini-GA is a portable electronic device especially designed for the certified aircraft, bringing terrain and obstacles to your panel. It is a reassuring reference when flying in instrument conditions, and greatly improves situational awareness, VFR or IFR. Internal or external GPS navigation and steering data is provided on the PFD. Highway-in-the sky guidance is provided to any runway in the database. It is a complete EFIS, incorporating the same technology that made GRT Avionics famous for its high-integrity attitude sensing (AHRS) in the experimental airplane market. It can be installed in minutes to update a traditional panel, or provides a valuable addition to any panel, at an unbeatable price. 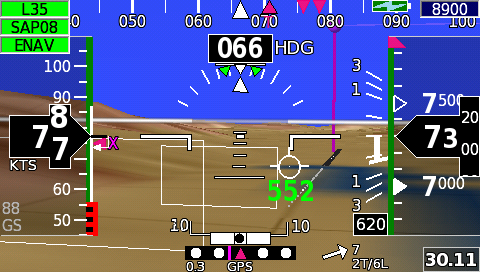 Here the primary flight display screen is showing terrain and relative height. 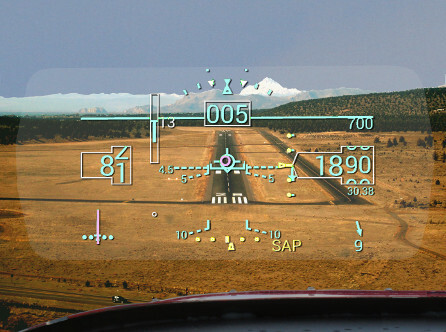 In the upper left the autopilot/flight director mode is shown as synthetic approach to runway 35. The flight director is commanding a slight pitch down in the center of the screen. 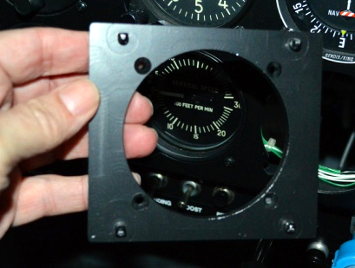 The airspeed and altimeter drums move smoothly and the high-contrast digits make them highly readable. Extending up from the runway is the way-point balloon. Rotating drums and tapes are driven by GPS data, making GPS derived altitude and speed data, as well as their rate-of-change easily observable. The moving map in arc-view mode. Notice the color-coded terrain. The moving map has the features you would only expect to find in a full EFIS. It includes such features as terrain relief, relative terrain height color coding, nearest functions, airport details including frequencies and runways, and much more. When connected to an external GPS, its flight plan and steering information can be displayed on and drive the map. 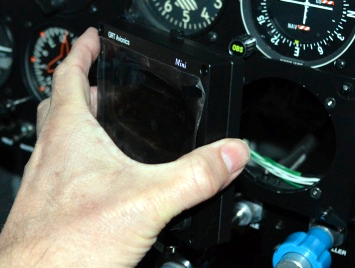 Hand-held or panel mount GPS navigators update their display once per second. Some EFIS based moving maps do same. The result is a jerky and delayed map. The Mini combines AHRS and GPS data to update its map at up to 15 times per second, resulting in a smoothly rotating map. Rolling out of a turn precisely on track becomes easy and the extended runway centerlines eliminate the guess work, making navigation easier and more precise. The Mini-GA extends its role by coupling to other navigation sources, such as navigation radios. The Mini includes and OBS (radial) selector for VOR or LOC/ILS navigation. Lateral and vertical deviations are also displayed on the primary flight display. Install the mounting plate into any 3 1/8” instrument hole, or use the flush mount (not shown) to mount the Mini-GA to any flat surface. The Mini-GA snaps into the mounting plate. Push-button latches (top and bottom of instrument) allow it to be removed as desired. The mounting plate provides spacing so that the Mini-GA can overlap nearby instrument without obscuring them to allow mounting the tight panels while still accommodating the highly-readable 4.3” screen. Qualifies as portable electronic device allowing installation in certified aircraft per PS-ACE-23-01-R1. The Mini-GA is not certified and cannot be used as a primary or back-up. Quick Release mount. Only requires power connection and placement of GPS antenna on dash. May be hard wired or plugged into a cigarette lighter. Installs in minutes. Provides attitude indicator, slip ball, directional gyro and turn coordinator. Synthetic vision provides a natural way of detecting nearby terrain and obstacles and position relative to nearby runways. Flight Path Markers show your path relative to terrain, obstacles and runways. Highway-in-the-sky guidance to any runway in the database increases approach accuracy and helps safeguard against shallowing an approach, day or night. Jeppesen databases available worldwide. Full moving map with terrain colored to show its proximity to your altitude, flight planning, nearest airports, weather frequencies, and even allows you to tune your compatible radio. Free US database. Incorporates a full AHRS solution. No external magnetometer required. Optional digital magnetometer providing magnetic heading, wind speed and direction. Allows full accuracy attitude data even when GPS data is unavailable. 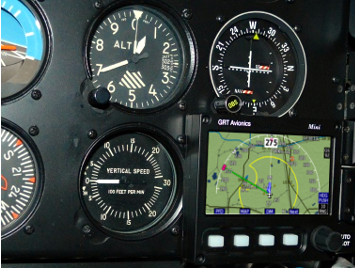 Flight director with heading/GPS NAV simplifies IFR flight. The flight director makes you the autopilot. It combines attitude control, altitude hold and navigation into one, simple-to-fly chevron command symbol. Increases accuracy and simplifies hand-flying IFR. A great safety enhancement for a VFR pilot that wanders into IFR. HSI display of GPS and navigation radio data, allowing it to be a backup navigation head for all Garmin navigation receivers. G430/530/650/750 interface capability via the optional ARINC-429 adapter. Can be wired to primary aircraft GPS for automatic flight plan transfer. Provides menu tuning for COM and NAV radio using SL30/SL40 protocol. Also works with GTR-200/225 and GNC-225. 1200 nit sun-readable display. Dimmable to less than 10 nits for night flying. 9-30Vdc input power. 0.25 amps max. Fully functional from -10 to +160° F.
Case CNC machined from aluminum billet.